Does the Moon affect the Earth’s Climate ? The Moon is Earth’s nearest astronomical partner and we all know that it is the principal cause of the ocean tides. Since it has such a large effect on the oceans can it also affect the Earth’s weather? The atmosphere is also a fluid and so the Moon generates gravitational tides there as well. However, these are much smaller than the Sun’s thermally generated daily “tides” which heat and expand the air diurnally mainly through absorption by water vapour. The Sun’s heating then also drives huge convection cells thereby generating the earth’s main wind systems like the “trade winds” westerlies etc. The Earth’s rotation turns these winds westerly in the northern hemisphere and easterly in the southern hemisphere. Why is it that the Moon’s gravity has a larger effect on the ocean’s tides than the Sun? The Sun has a far larger direct gravitational force than the Moon. The Moon orbits the earth and then both together orbit the Sun. The tides are a subtle effect caused by traction (lateral attraction) of the oceans by moon’s gravity and because the Earth – Moon system rotates about their centre of gravity which is a point some 4000 km from the Earth’s centre. It turns out that the tidal force is proportional to 1/r**3 and not the direct gravitational 1/r**2 force. This explains why the lunar tidal force is stronger than the solar tidal force because it is over 500 times closer to the earth. The tides are caused by 2 tidal bulges – one nearest to the Moon and the other on the opposite side to the Moon. The one on the opposite side is actually the result of the centrifugal effect of the Earth Moon rotation. In fact the ocean on the side opposite to the Moon is bulged outward due to this centrifugal force . Tides are greater at higher latitudes which is why the strongest tides in the world are found in Canada and Northern Europe whereas relatively weak tides are found at the equator. Enough about the oceans. What about the atmosphere? There are also tides in the atmosphere but they are dominated by the daily solar heating effects which of course also drive the weather systems. The lunar tides are more subtle but have been measured in the Antarctic and even at the equator. The 12 hour cycle induces small but regular pressure changes and winds which can reach 10m/sec. The Earth’s weather is driven by the Sun’s heating especially in the tropics which cause huge convection cells. If the Earth did not rotate then the warm air from the tropics would tend to move north or south and mix with colder air. The coriolis force of the Earth’s rotation drives the prevailing winds, such as the trade winds, westerly in the Northern Hemisphere. Storms and depressions are generated at the interface of the cold polar air and the warmer temperate air. We often hear the remark that weather systems are chaotic and a hurricane can be triggered by the flapping of butterflies’ wings. Therefore it seems a reasonable hypothesis that the lunar tides may be one trigger for stormy weather, especially as tides are stronger nearer the poles. During the lunar month there are 2 so-called spring tides when the Moon and Sun align so their tidal effects sum up. The above hypothesis would imply more stormy rainy weather with the spring tides. Another effect is the precession of the lunar orbit with a timescale of about 18 years. This actually changes the inclination of the Moon in the sky, effectively moving the tidal bulge to a more or less northerly position. I am aware of at least one study that has shown a correlation of droughts in North America and China with this 18 year lunar cycle. Here in Italy no-one would ever plant seeds or bottle wine except on what is called “luna callente” – or the falling moon (after the full moon). I don’t believe there is any real evidence that this has any effect at all but a surprising number of Italian scientists believe it as well ! Similar folk lore about the Moon’s effect abound in many cultures, so what other ways can the moon affect the weather? There are 2 other direct astronomical effects the moon has on the Earth’s radiation balance and there seems to be one very important long term benefit. 1) The centre of mass of the Earth Moon system is actually about 4000 km from the centre of the Earth. As the Moon orbits this point so too does the Earth “orbit” the centre of mass point. In other words the Earth changes its position relative to the Sun by about 8000 km. The mean Earth-Sun distance is about 150 Million km so the monthly change in solar radiation caused by the 1/R**2 attenuation is about a 10**-4 effect leading to an approximate 0.03 degrees change on the earth. 2) Reflected sunlight from the Sun. So-called moonshine is simply light reflected or re-emitted from the moon and this radiation serves to heat the earth slightly. This also varies with the phases of the moon during the month. This extra radiation is just 10**-5 that of the direct solar energy so this also gives a roughly 0.01-0.02 degree effect. 3) Stabilising the Earth’s axis. It seems likely that without the moon’s stabilising gyroscopic effect the earth’s axis would be more chaotic. The seasons rely on the axis being tilted to the orbital plane of the earth-sun by about 23 degrees. Computer simulations show that the moon’s tidal effect has probably stabilised this tilt over billions of years. The axis of Mars seems to be affected by a chaotic effect caused by the influence of other planets in the solar system. Clearly maintaining summer, winter conditions for each hemisphere has had a massive impact on the earth’s climate and this could also be the key to life developing. In conclusion, the Moon does affect the Earth’s climate. It may even be fundamental to the maintaining and stabilisation of the seasons. There is also growing evidence that the Moon can influence generations of storms and rainfall, (although untangling this effect from the influence of Sun Spots is not universally accepted). Eventually energy loss by tidal forces will slow the length of the day to say 25 hours and the Moon’s distance from the Earth is also slowly increasing. Luckily any noticeable effects will take 10s of millions of years and way before then the next Ice Age will be far more of a problem for mankind. 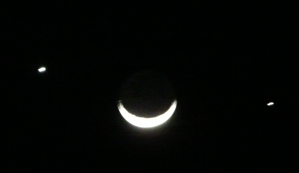 I took the picture above of the Moon from Mombasa airport while boarding a plane on December 1st 2008. I had no idea that Venus and Jupiter were actually in coincidence with the Moon’s position that evening. It was a truly remarkable sight and reminded me that we shouldn’t take the Moon for granted ! 27 Responses to Does the Moon affect the Earth’s Climate ? Sir: I am developing a theory about moon position relative to predicted hurricane path (in the northern hemisphere around the east coast of America; whether a hurricane breaches the gulf coast or runs up the entire atlantic seaboard). My question – what type of magnetic field does the moon emit? I find it too coincidental that the moon’s face is alway “locked” toward the earth, and am wondering if the moon, racing around the surface of the earth, has an electrical generation (heating) capacity. thank you. PS: This would also seem to lead to possible impact on drought cycles, as opposed to an “el nino” affect. Also, if you could comment on NASA detonating some type of explosive on the moon surface, and whether this was wise, I would appreciate your opionion. The moon has a very small magnetic field which is thought to be the remnants of when the core was molten (like Earth’s is today). I am unaware if this has any effect on the Earth. The Earth’s magnetic field is thought to be generated by a dynamo effect of swirling electric currents in the Earth’s iron core. The reason why the moon keeps the same face towards the Earth is because tidal effect of the Earth on the Moon has essentially sapped all the angular momentum from the Moon. Probably it used to spin on it’s axis but has now slowed down so that it spins once a lunar month . Essentially it is like the ball and hammer spun round by an athlete. The face with the chain attached is always facing the thrower. The idea that lunar tidal effects on the atmosphere effect hurricanes storms and perhaps even their track across the Atlantic is interesting. It would be interesting to see if there was a correlation between spring tides and hurricanes. A spring tide is when the Solar and Lunar tides re-inforce each other. Probably NASA did some seismic tests using explosives to measure the Moon’s internal structure. I doubt whether this can have had much effect, especially when compared to meteor impacts ! I think a study of correlations of storms and hurricanes with both the Lunar orbit precession (22 years) and with Spring Tides would be an interesting research project. Just found your website on yahoo and i think it’s a shame that you simply aren’t ranked higher given that this really is a wonderful put up. To alter this I made a decision to save your internet site to my RSS reader and that i will try to point out you in one particular of my posts mainly because you genuinely deserv much more readers when publishing content of this high quality. Shouldnt it be called ‘Does the moon >affect> the Earth? Thank you for such a great work. Nonetheless, I often ask myself a question: what is the tidal effect of the moon on the liquid core of the Earth? Does it help create the magnetic field of our planet by dragging current-carrying metal core tubes, or at least did it help when the two celestial bodies were much closer to each other, even though the core was not so distinct then? If there was an increase in magnetic field due to this, did the moon then help separate metal from isolant as current-carrying metal was subject to the magnetic field but melted rock was not? In a resistive mixture of melted metal and rock such as that, did the increased electric current due to the orbiting moon tidal drag help generate more heat, thus increased convective movement and higher core temperature, thus affecting the climate of the Earth? Ummm…. sorry, it is a collection of questions rather than a question. To summarize: did the moon tidal forces on the core affected the Earth’s climate? The Earth’s magnetic field is generated by the molten iron core of the Earth. The Coriolis force tends to generate currents aligning the resultant field with the rotation axis – North South. Roughly every 50-100,000 years the magnetic field reverses – South becomes North, and as far as I know no-one understands why. There must be a lunar tidal force on the liquid core of the Earth. It is therefore conceivable that this effects the positioning of the magnetic poles. The Earth’s magnetic field has an indirect effect on the Earth’s climate because it protects us from the solar wind. I came here looking for an answer to this question, maybe you could help me. Would the Earth’s atmosphere be considerably thicker if it didn’t have a relatively large moon? I’ve heard (a long time ago, andI can’t find the source) our atmosphere has been at least partially dispersed by the moons gravity over time and was curious how that would effect the habitability of exoplanets that might be very earth-like, but lack large moons helping to thin their atmospheres. Ive read that in a number of Larry Niver science fiction stories. I don’t know if it’s true. I am wondering what would happen if the moon was significantly closer to the Earth. I realize that huge tidal waves would occur, almost tsunami force, But would the wind also be affected? Would there be, in some cases across the world, a wind so strong it would be hard to walk outside? Also, how big of an object would be needed to propel the moon far enough to reach the ideal place where these weather anomalies would occur? Sorry for the in depth questions, i am writing a paper and would like it to be as close to reality as possible. Thank you so much for your time! It is much appreciated! The moon was significantly closer to the earth millions of years ago. Tides increase as the third power of distance so yes there would have been far stronger tides in the past. However wind is driven by the thermal imbalance from the eqUator to the poles so I think there would have been a smaller direct effect on winds but instead on the overall climate. I think the moon has a larger effect on the polar Jet stream flow in winter – more soon. There is also the possibility that Milankovitch changes in the earth’s orbit also effect the moon’s orbit round the earth. This could explain why the ice ages follow a 100,000 year cycle ! Currently we are suffering heat waves in Southern Africa which are ascribed to Global warming, however, the moon is very close to the earth at present. Could this be an alternative explanation for the abnormally hot weather and shortage of rain? Blame Richard Lindzen for not figuring this one out. He had over 40 years at his disposal and a boatload of graduate students . Go figure. I think El Nino is most likely to blame for the heat waves in South Africa as it changes weather patterns globally. South Africa tends to get warmer and dryer in a strong El Nino year like 2015 starting after your spring. However it is entirely possible that the moon indeed plays a role in the timing of El Nino, so a supermoon (nearest approach) may have a subtle effect. Just one question: What kind of an affect would a second (or third) moon have on Earth’s climate and tides? I think a greater number of moons would increase the gravitational force with greater effects on atmospheric circulation. Jet Stream would increase the speed and the effects on climate with situations weather extremes and violent. just think of what happens on Jupiter or Saturn! jet Stream would speed of 600 km / h up to 1600 km / h. In the Earth, the tides affect changes speed and direction Jet Stream changing weather conditions in the world. I think it may well do in winter months and for northern latitudes. Atmospheric tide can distort the polar jet stream and trigger storms. There are many similar reports across northern continents of a correlation between droughts and floods with the 18.6y cycle of the lunar precession. The precession changes the maximum latitude(declination) of new and full moons. This changes the magnitude of spring tides in the ocean and in the atmosphere which in turn affects Jet Stream flow, strength and path of winter storms. QBO is intimately related to the jet stream, and remarkably the QBO time series aligns precisely with the principle lunar periods, aliased to reinforce with the seasonal cycles. I uncovered a team at NASA JPL that proposed studying these effects a few years ago but haven’t seen much progress beyond that. Ian Wilson and Nicolai Sidorenkov have been looking at this as well. I rationalize why this behavior hasn’t been noticed in the past but then realize that Richard Lindzen is the grandfather of the current QBO theories and models. He has a pretty poor track record of getting things right, i.e. see his failed “iris cloud” hypothesis among others. He also seems to be an argumentative contrarian who won’t easily let go of his own ideas. These types tend to bully their peers into submission. This of course is in the realm of whether “correlation equals causation”, but the parsimony and plausibility of the recent findings are much too striking too ignore. This has huge implications for ENSO and El Nino, as both QBO and ENSO share the same lunar tidal forcing frequencies. Keep digging at this Clive, and check out Ian Wilson’s blog as well.